Winter in Winnipeg is no joke. You don’t earn the nickname, Winterpeg, for nothing after all. Around this time of year, it’s not uncommon to hear friends and family complain about the winter taking a toll both physically and mentally. To combat these winter blahs, many cities and their residents work hard to create a positive winter culture. Insightrix wanted to know how the City of Winnipeg and its residents created a winter culture all their own – like how do they spend their time outdoors during the winter, how cold is just too darned cold and what else could be done to promote a positive winter culture in Winnipeg. We surveyed 360 residents of Winnipeg between February 12 and 15 using ManitobaWatch® – the Insightrix online research panel in Manitoba. ManitobaWatch sample quotas are set by age, gender and region to match the general population of the province, and since the research is conducted online, it is considered to be a non-probability proportion sample. Therefore, margins of error are not applicable. It takes a little more than cold weather to keep Winnipeggers indoors. When we asked Winnipeggers how cold is too cold, 64% said that between -15°C to -30°C is too cold for them. More than one fifth (21%) are tougher, saying -31°C to -40°C is too cold for them, and 3% say anything colder than -46°C is just too cold. Others were less tough, with 4% saying -6°C to -15°C is too cold and another 1% saying 5°C to 1°C is too cold. It might be safe to say this last 1% of the Winnipeg population may be living in the wrong place. The people of Winnipeg think winter culture is alive and well in their city. When we asked Winnipeggers whether they thought the City and its residents have done enough to create and support a positive winter culture in the city, more than two thirds (69%) agree. Conversely, less than one third (31%) disagree, and wish more were done to create and support a positive winter culture in the city. Winnipeggers made several suggestions for ways the people and the City could create and support a positive winter culture. The most common answer we received was that better snow clearing should be provided (63%), followed by building more heated bus shelters (58%) and creating walkable spaces for pedestrians that are shielded from the wind. The people of Winnipeg also suggested making improvements to the transit system (48%), providing more lighting in key areas (45%), holding more public events/festivals and building more public parking (39%). * Other common answers are noted in the infographic above. Have questions YOU would like to ask? Do you have a question you would like to ask Manitoba residents? Try our omnibus service – OnTopic™– to learn more about what Manitobans think about any issue that matters to you. *Note that percentages total to more than 100% as participants were able to make multiple selections. 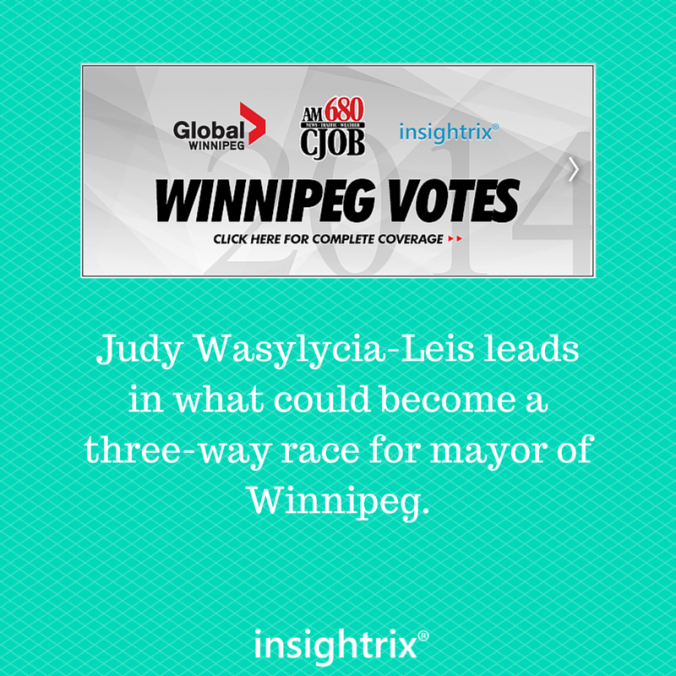 A new telephone poll conducted by Insightrix Research in partnership with CJOB Radio and Global TV shows Judy Wasylycia-Leis currently leads the mayoralty race in Winnipeg. Fully 38% of decided voters say they would cast their ballot for Judy Wasylycia-Leis, well ahead of Brian Bowman (24%) and Gord Steeves (20%). The remaining mayoralty candidates each earn voter intention percentages in the single digits. 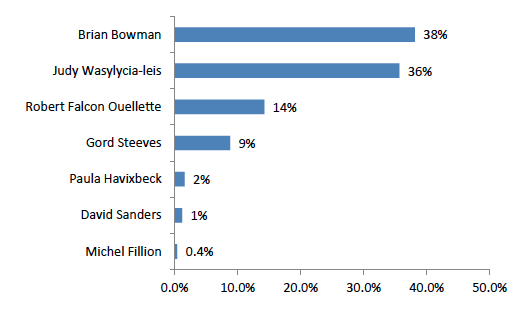 Support for Judy Wasylycia-Leis is higher among females and those over the age of 35, while Brian Bowman tends to have greater support among males. 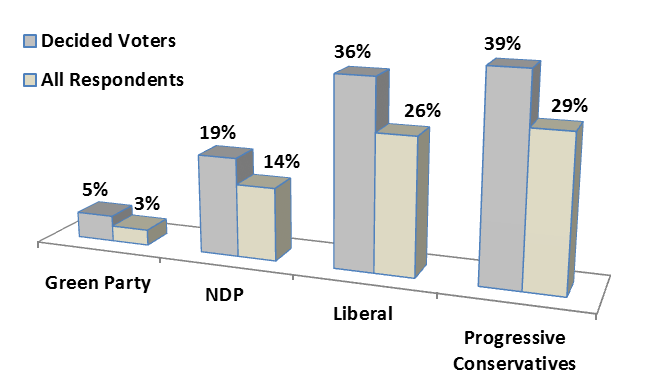 However, most telling is that 34% of Winnipeg residents who say they plan to vote in the upcoming civic election are uncertain as to who they will vote for. With this level of undecided voters, results on election day could vary significantly from this relatively early poll in the election campaign, creating a potential three-way race among the front-runners. The poll also asked Winnipeg residents what they believe is the number one issue facing the city. Resoundingly, addressing infrastructure issues is noted by one half of the city’s residents (49%). Crime and policing, the second most frequently mentioned key issue, are noted by only 8% of residents. Turning to education, roughly equal proportions believe that Winnipeg residents spend too much in school taxes (37%) or about the right amount (38%). Fully 8% feel residents pay too little in school taxes and 17% are uncertain. When presented with four different issues facing Winnipeg schools, approximately equal proportions of residents believe that the most important items to address are proper focus on reading, writing, and arithmetic (34%) and teachers advancing students to the next grade even though they may not be ready to do so (28%). 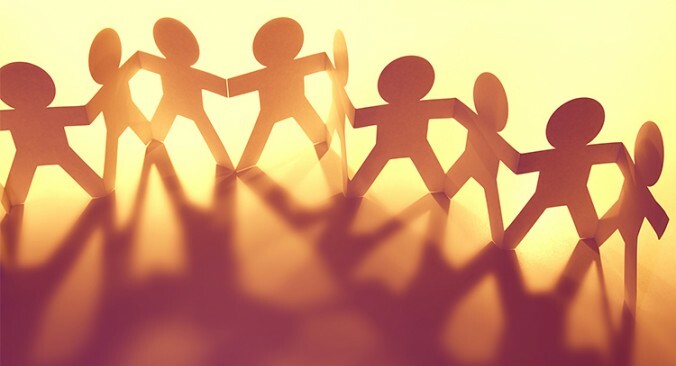 A total of 14% believe bullying is the most important issue facing schools, while 11% say it is teachers spending too much time with problem kids at the expense of the rest of the class. Another 13% are uncertain. A total of 799 randomly selected Winnipeg residents participated in the telephone research study between August 20th and September 4th, 2014. The margin of error is equal to +/-3.5 percentage points, 19 times out of 20. According to a telephone poll conducted by Insightrix for CJOB News and Global News, the majority of Manitoba residents believe that marihuana should either be legalized and taxed or decriminalized. 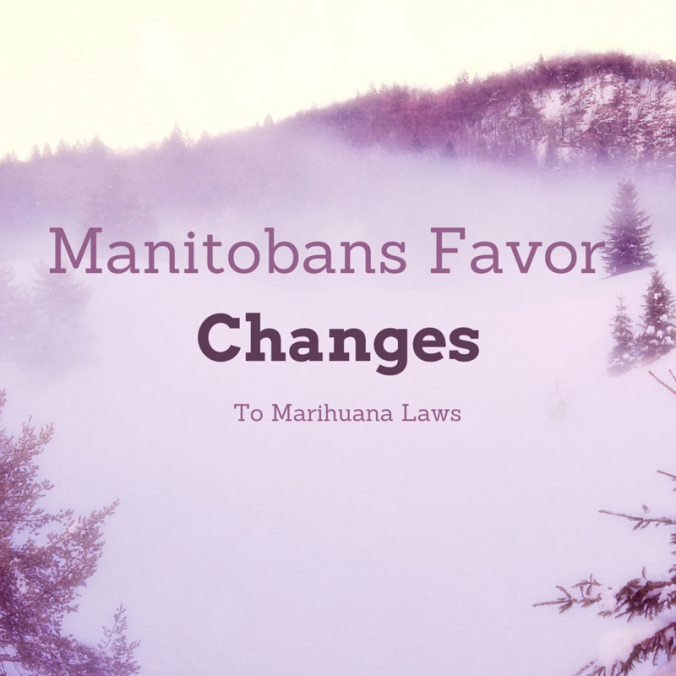 The poll surveyed 800 Manitobans and only 40% of respondents say that the current marihuana laws should remain. 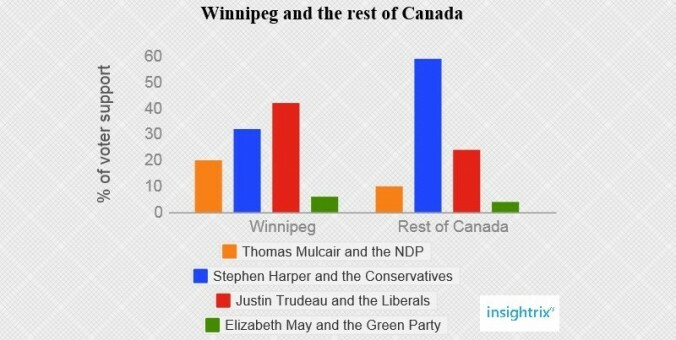 In collaboration with 680 CJOB News and Global News, Insightrix recently conducted a poll with Winnipeg residents and asked who they would vote for if a mayoral election were held that day. The poll found that 42% of decided voters would support Judy Wasylycia-Leis, 17% would support Gord Steeves, and 12% would support current mayor Sam Katz. Behind the top three are City Councillors Paula Havixbeck (9%), Scott Fielding (6%), and John Orlikow (6%), and Winnipeg lawyer Brian Bowman (6%). In the poll, 59% of respondents stated that they would vote for a mayor who is not currently on City Council. Respondents were asked about trust in city hall to manage the city effectively: in total, 67% of respondents expressed very low (27%) or somewhat low (40%) trust. Turning to the Mayor, 35% of respondents strongly disapprove of his performance and 27% somewhat disapprove. 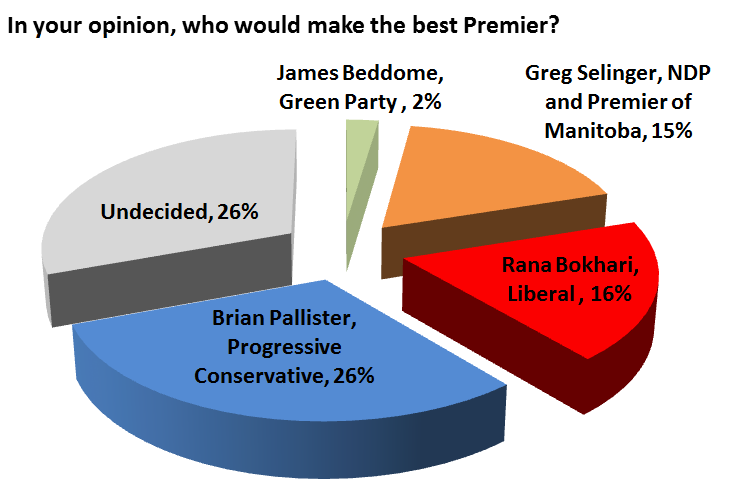 Winnipeg residents also provided their views on Mayor Katz’s leadership and 32% believe that he is taking Winnipeg on the right track, while 52% believe that he is guiding the city in the wrong direction. To learn more about the poll results and details on levels of satisfaction with city services, please go to http://www.cjob.com/2014/02/10/24208/.